Although isn't one of the most common ways to play, there are many examples in pro games; and in particular the tsukenobi lines seem still to be developing and to lead to many complications such as running fights. These are some of the most unusual and difficult joseki for the 4-4 point. Jared: In "power of the star point" Takemiya recommends against sanrensei. Jared: and are expected, is common. Then for shape. Now Black has miai of a and b. 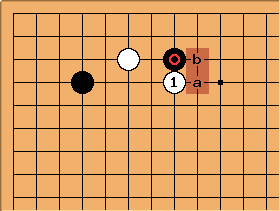 If Black plays at a, White may take b, and vice versa. Jared: The idea is to control the center, giving white the power to reduce the sanrensei. xela: Is at b or c playable? To me, makes sense as leaning on the left to attack on the right. Hyperpapeterie: A search at gobase found something like 20 games featuring the move at b, a handful of which were recent. 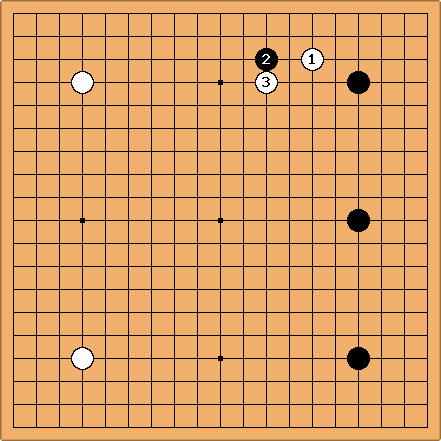 Kogo's lists black's responses as being at d or e, both of which appeared in pro games. White's move at b actually seemed more common than .